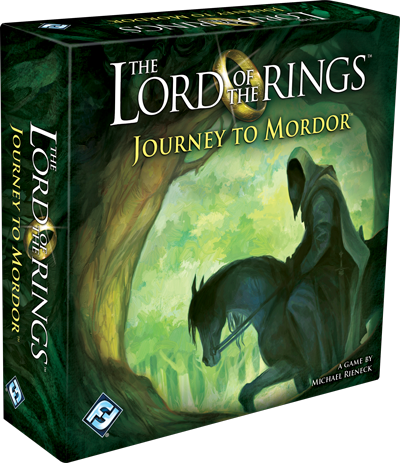 Fantasy Flight Games is proud to announce The Lord of the Rings: Journey to Mordor, a fast-paced dice game for two to four players that puts you in the shoes of the Fellowship, racing to reach Mordor and stay one step ahead of the Ringwraiths! Frodo’s quest and his perilous journey to Mordor form the backbone of one of the most thrilling fantasy sagas ever—J.R.R. Tolkien’s The Lord of the Rings. Along the way, the Fellowship was plagued by danger. Orcs ambushed them, wild beasts tracked their movements, and always surrounding them was the ever-present threat of the hunting Nazgûl. Their journey took months, but now, you can experience the thrill of the Fellowship’s desperate race in a fraction of the time with The Lord of the Rings: Journey to Mordor! 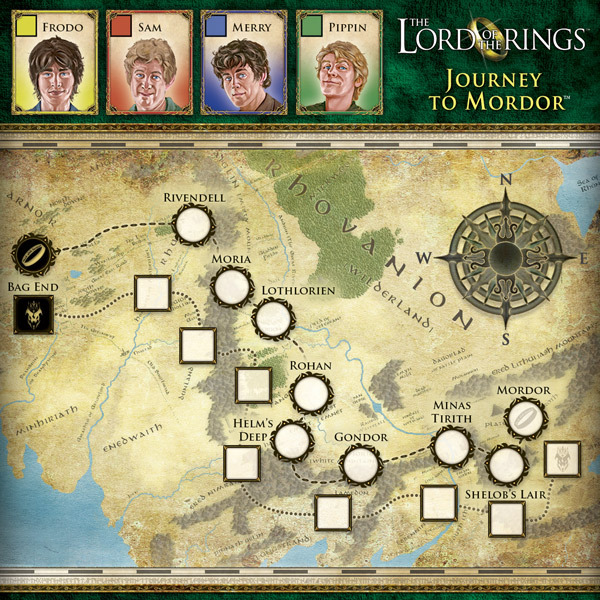 Journey to Mordor is a dice game that puts you and each of your friends in the roles of one of the four Hobbits in the Fellowship: Frodo, Sam, Merry, or Pippin. Together, you must travel along the route of the Fellowship, from Bag End and Rivendell, through the deadly mines of Moria, and finally ascending through Shelob’s Lair to reach Mordor and the Mountain of Fire itself. Every turn, you’ll need to press your luck, battling Orcs and staying one step ahead of the Nazgûl that pursue you. The player who makes it to Mount Doom first and destroys the One Ring is the winner, but beware! If the Nazgûl make it to Mordor before you, you’ll be eliminated, and the fate of Middle-earth will rest on your companions. 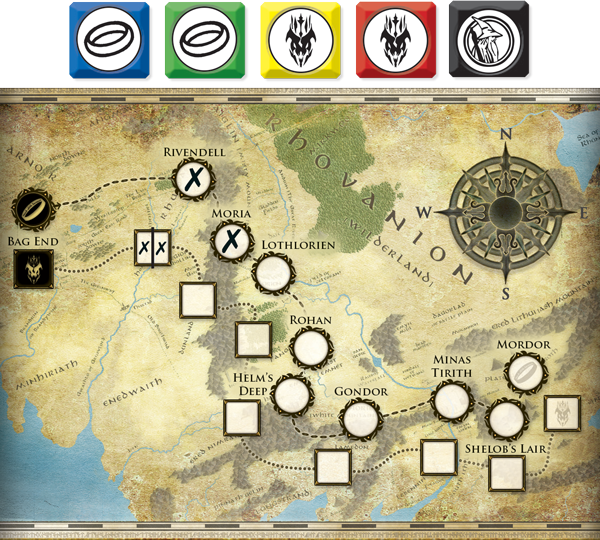 At the beginning of a game of Journey to Mordor, you see your treacherous path laid out before you—each player is given a sheet of paper depicting a map of Middle-earth. Across the map, two tracks are traced, leading from Bag End to Mount Doom. One of these tracks is for you to follow, the other is for the Nazgûl that pursue you. To win the game, you’ll need to advance along your track and reach Mordor, but if the Nazgûl outpace you and reach the domain of the dark lord before you, you’ll be eliminated! 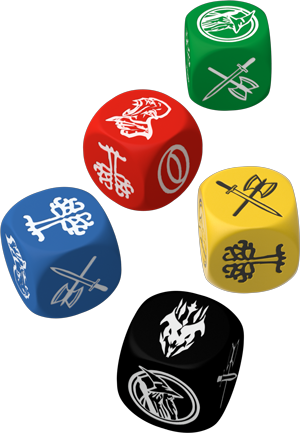 On your turn, you’ll roll all five dice and examine the symbols that you receive. You can choose to keep any number of dice, but you must always keep at least one die, and you can’t keep two dice that show identical symbols from the same roll. For instance, if you roll the dice and receive three Ring results, you can only keep one of them. To gain more Rings, you’ll need to roll the dice again and see what happens! You’ll keep rolling the remaining dice on your turn until you’ve chosen to keep all of your dice. The dice that you roll represent both the heroic efforts of your Fellowship and the forces arrayed against you. Your primary means of moving closer to the Mountain of Fire is by rolling Rings. After you’ve finished rolling dice, you advance one space along your track for each Ring that you’ve kept. Your Ring results are always in danger however—Orcs may ambush you and force you to suffer a crippling delay. If there’s a single uncanceled Orc among your kept dice at the end of your turn, it cancels all of your Rings! Fortunately, you can fight off the Orcs and cancel their dice by keeping Fellowship results. The Orcs aren’t all you have to worry about on your journey: the Nine are abroad, and they are hunting ceaselessly for you and your companions. Whenever you roll Nazgûl results on your dice, you must keep at least one Nazgûl from that roll. After you’ve finished rolling dice, each die showing a Nazgûl will cause the Fell Riders to advance one space along a track—but they don’t necessarily need to come after you. By choosing the dice that you keep carefully, you might be able to send your dread pursuers after the other players and prevent them from harrying you. You can also slow the Ringwraiths’ progress by keeping Gandalf results that you roll. For each Gandalf result that you’ve kept at the end of your turn, you can draw a line to divide a space on the Nazgûl track into two spaces—essentially forcing the Ringwraiths to move further before they’ll reach Mordor. By keeping the dice shown above, you advance two spaces along the Fellowship track and divide the first space of the Nazgûl track in two. Then, the two Nazgûl results fill those two spaces. The final result that you may choose to keep is The White Tree. This result is found only on the black die, which is normally the most dangerous die for you and your fellow Hobbits. If you choose to keep The White Tree, you may immediately stop rolling dice and resolve the dice that you have currently set aside. If you’ve already collected the beneficial results you want, and you don’t want to risk losing everything to the Nazgûl or an Orc ambush, The White Tree can give you just the edge you need to escape. You’ll need caution and intelligence to reach Mordor alive, but you’ll also need to know when to take a risk and act with the utmost bravery. The Nine Riders are on your trail, and you can’t afford to slow down now. Prepare to experience all the excitement of Frodo’s quest in a fraction of the time—you can look for The Lord of the Rings: Journey to Mordor at your local retailer in the fourth quarter of 2016!